Peta Kiellor heads up the tight-knit team at Caringbah, and when she’s not inspiring young minds and her team, you can find her volunteering at the NSW Rural Fire Service and spending time with her young daughter. We chat to Peta to find a bit more about her and what Early Childhood Education means to her. I began my traineeship in 2012 and have since moved through the positions of Room Leader, Educational Leader, and Assistant Centre Manager. I currently hold a Diploma of Early Childhood Education and Care and have begun my Bachelor of Education (Early Childhood). My philosophy is that we should view children as capable, competent individuals who are committed to their education. We are supporting children to develop an emerging understanding of our ever-changing world. Many of our jobs today did not exist even twenty years ago, and the possibilities of the jobs our littlest people could hold once they are working age is infinite! We need to help them to understand the possibilities their own life may hold, and the potential influence they have on both their own future, and that of their peers and future families. I am driven by supporting and engaging with my team to further their own thinking about early childhood and push their personal reflection into deeper territory – I enjoy doing this with the children too, how can I support them to grow as a person and be deeply involved in the drive of their own educational program. I believe all children should have opportunity to reflect on their learning and be an active contributor to their educational experiences. Who or what inspires you in relationship to your role as Centre Manager? How could I go past the exceptional relationships we have opportunity to build with the families of children who attend our centre? I am constantly inspired by the many different families I have opportunity to engage with, who bring little parts of their culture into our service and support us to know and do better? I’m also inspired by Centre Managers and leaders before me, especially those who took so much time to mentor me and provide support and guidance readying me to step into this role. We are only as good as our team and the leaders before us, and I am lucky to have an exceptional team, whom I am very fond of! When not at the centre, what can we find you doing in your free time? I am mum to an energetic little girl who I devote the majority of my time to. When I am not with her, you can find me at my local NSW Rural Fire Service Station in Heathcote where I have been an active volunteer since 2012. I do everything from mentor junior firefighters to drive the trucks – it keeps me busy! What makes Caringbah such a wonderful centre? I think Caringbah is so unique, our building has beautiful soaring ceilings and so much natural light and is the first centre I have worked at with such wonderful open spaces. We have some wonderfully supportive long-standing families that have shared our journey with us so far, and we’re building new relationships every day. Caringbah has such a unique feel to it, and you can easily get lost in our outdoor space (not in a bad way! ), we’re almost surrounded by urban density yet you can find a peace here – how wonderful is that? Lastly, what do you love about the Caringbah community? The Caringbah community is very connected, we’ve been able to build great relationships with local businesses such as Civic Disability and the local primary schools. It’s been easy to get out and about and understand what our local families need as everyone is so willing to have a chat and are so welcoming. 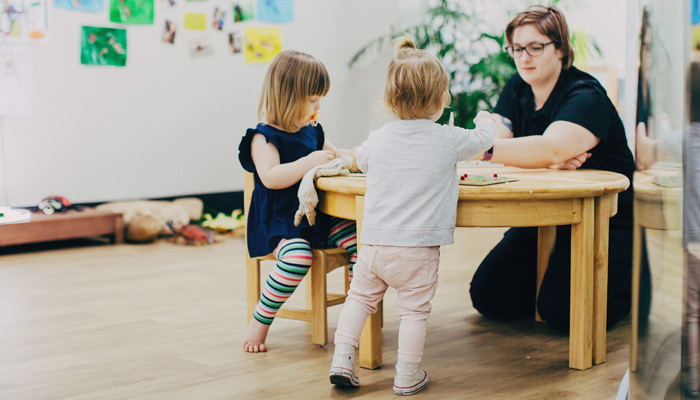 To find out more about this amazing childcare centre in the Sutherland Shire, and to book yourself in for a private tour, head here.